The complimentary Summer Card is your entry ticket to over 100 top experiences and over 90 bonus services. During the summer and the winter, hikers, winter sports and ski stars from all over the world, are attracted to this popular holiday region. Our JUFA family hotel in Schladming is located in the town center of Schladming and yet only 200 meters from the famous Planai! Whether hiking, climbing, skiing or cycling, the impressive landscape of the Dachstein region can be enjoyed actively or comfortably. A private hotel indoor adventure area with a climbing wall and table tennis ensures active leisure time, even during bad weather. Kids enjoy themselves on the playground, while their parents relax in the Finnish sauna, steam bath or unwind in the infrared cabin. After an extensive skiing or hiking tour, we recommend coffee, cakes and a cosy get-together in our cafe. The lively Schladming town centre is also attractive at any time of the day or night! Due to the central location of the JUFA Hotel in Schladming am Dachstein, children can accompany their parents on walks through the town in the evening. The location is also ideal for seminar participants: Easy accessible, with own parking places and a modern seminar room, the implementation of your programmes can be well prepared in advance. Take advantage of the various surrounding framework programs for successful networking! The JUFA Hotel Schladming*** is located in the centre of the town of Schladming and is only a few steps away from the Planai Valley Station. It is a perfect base from which to embark on infinite adventures and can be reached easily by car. Parking spaces for cars and buses are available to hotel guests for a fee. Travelling from Graz: Travelling on the A9 – take the Liezen exit – take the B146-Ennstalbundesstrasse until you reach the entrance to Schladming – turn right after the petrol station and the ARBÖ to Schladming Ost/Planai Valley Station (Talstation) – continue straight ahead until you reach the roundabout – take the third exit / continue until you reach the roundabout next to the police station – take the second exit – continue down a narrow street (Berggasse) – turn right at the car park – turn right again – continue past the post office – turn right again – welcome to the JUFA Hotel! Travelling from Linz: Travelling on the A1 westbound – at the Knoten Voralpenkreuz junction take the exit towards Liezen/Phyrnpaß/Graz – from Liezen follow the instructions detailed above. Travelling from Salzburg: Travelling on the A10 Tauern motorway – take the Eben/Pongau exit – B146 – on arrival in Schladming Ost/Planai Valley Station (Talstation) – follow the instructions detailed above. The complimentary Summer Card is your entry ticket to over 100 top experiences and over 90 bonus services in the Schladming Dachstein region. Your child also receives their own KidsCard. In the heart of the Dachstein Tauern region, you will find the largest climbing park in Austria. The park was opened in 2005 and offers 18 different courses constructed at different levels of difficulty, ranging from 2 to 15 metres in height. You and your family are certain to enjoy hours of fun and challenging adventure at the park. There are over 200 different stages waiting to be conquered. Fly along at full speed on our electric go-karts on a 300 metre long course that runs through the underground car park at the Planai World Championship Park. Pick up top speeds on our 18 top-quality modern e-go-karts. So much fun, but with zero emissions! Your adrenaline will be pumping and the tyres will be smouldering as you reach speeds of up to 70 km/h. Enjoy plenty of summer fun at the Pichl leisure park, which, in addition to the beautifully landscaped bathing lake, offers a number of excellent facilities, including a generously sized children’s playground with a bouncy castle, table tennis and beach volleyball. There is something for people of all ages to enjoy. During the summer months, guests using the bathing lake are also treated to evening water laser shows. Holders of the Schladming-Dachstein Summer Card can use the bathing lake free of charge. The JUFA Hotel Schladming*** is not only a popular holiday destination, but also provides an expert service for businesses wishing to hold seminars, training events, team meetings or workshops that are run over several days. Would you like to hold your meetings in the centre of the town in close proximity to the world champions? Do you like the sound of holding seminars outside in the fresh area and drawing creative inspiration from the spectacular mountain landscape? Situated in an impressively scenic location, our WM seminar room (38m²) and the Medal Plaza Café (200m²) offer guests the benefit of bright natural light and are equipped with modern conference technology. Pin boards, projection screens, CD and DVD players, video projectors, facilitator’s toolbox, flip charts and much more are available for your use. It is not only our modern facilities equipped with the latest technology that will make your event in the Schladming region more productive. The JUFA Hotel Schladming*** can also offer a range of indoor and outdoor activities designed to boost energy levels. You are certain to be inspired by the range of exciting offers available for you to enjoy with the Dachstein Card (included)! Special packages that can be booked include: team building events, rafting, canyoning, archery, tandem paragliding, golf, climbing tours, hiking, mountain biking, cycling, the Schladming-Dachstein 4 peaks ski circuit, the Dachstein glacier. We will be more than happy to help you with the organisation and implementation of your plans. For further information, please contact the JUFA Hotel Schladming*** directly. Our team will be happy to provide you with all the information you need! A strong team spirit and a positive working atmosphere cannot be taken for granted. However, it can be learned. The JUFA Hotel Schladming*** has the perfect facilities to suit your particular requirements, whether you are supervising a programme for school-aged children or running training activities for an association or a company. Students attending field trips can enjoy an engaging social experience and will learn about team skills. Staff attending company outings and training courses also find that their motivation levels, communication and team skills are enhanced. The Schladming-Dachstein Summer Card provides visitors access to a range of top tourist attractions in the region and is included in the hotel’s room rate. Fresh and stimulating mountain breezes gently blow across the Schladming-Dachstein region. The many sightseeing locations that are within easy reach offer a range of fantastic experiences and the excellent facilities at our hotel ensure that school outings and trips organised for companies and associations are truly memorable. Looking for tips for group excursions? The many activities and attractions in close proximity to the JUFA Hotel Schladming*** means you are spoiled for choice: The Schladming Leisure Park, the Planai Adventure Park, the Dachstein Glacier, Schladming minigolf, the Ramsau Leisure Park, Forest Park Indoor, Untertal Wild Waters, Schladming Adventure Pool and so much more. For further information, please contact the JUFA Hotel directly. Our team will be more than happy to provide you with all the information you need! "Empfehlenswert - für Familien und Gruppen." 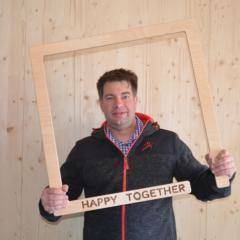 "top lage, wunderschöne region, personal super, "
The hotel manager Christian Sampl and his team are available to answer your questions at any time! Im interested in the offer "JUFA Hotel Schladming***" in the .